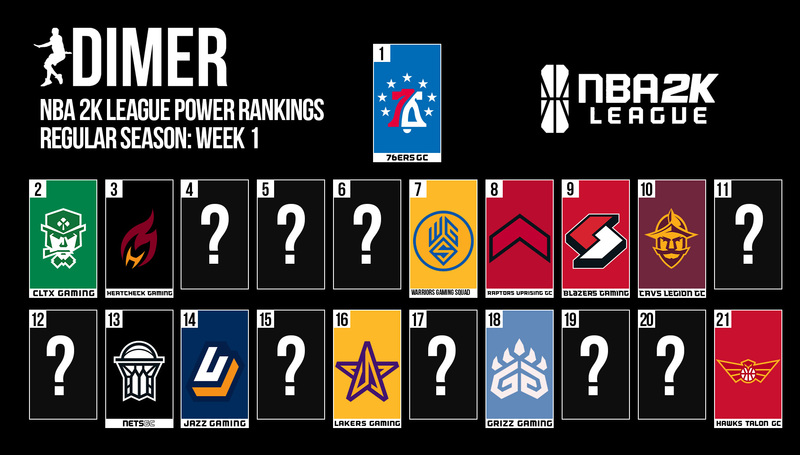 The regular season is finally upon us, and you know what that means: power rankings. In an attempt to make everyone angry sort through what should be a competitive season, we’ll be ranking each team based on a number of factors: results, quality of play, strength of schedule and so on. Results aren’t everything, otherwise we’d just copy and paste the league standings into here. These are a composite ranking of our three writers’ own rankings, aggregated into one. Let’s get to it. Hawks Talon needs to figure out its point guard situation. And until that’s figured out, this team will continue to struggle throughout season two. The Pistons have some promising pieces. However, it didn’t look like the pieces worked well together at the Tipoff. Will the Kings find a way to get past the off-court drama? It didn’t quite look like it at the Tipoff. Vandi struggled mightily in the Tipoff, and he and star AuthenticAfrican need to develop chemistry sooner rather than later. The defending champs see the biggest drop in our power rankings. Going 0-2 in their Tipoff games was not ideal for a team coming off a title run. Vert is the Lakers point guard. No need to read that again, it’s true. How long will this experiment last? Will the Wizards continue to believe in ReeseDaGod as their offensive spark? Or will DemonJT step up and take off some of the load? Adjusting to Compete at the 3 is the first order of the day, but Ria already looks like a more than worthwhile No. 1 pick. The Nets were able to stifle reigning champs and cross-town rivals Knicks Gaming. Yet, they came up short against Magic Gaming. Which version of the team will we get in week one? The most shocking team from the Tipoff Tournament. They were nothing as expected as they beat season one favorites Blazer5 Gaming. Look for the Bucks to build on that momentum in the regular season. The Mavs struggled early and could easily chalk it up to inexperience. The Mavs have the talent, but can they persevere through the pressure on that stage? Cavs Legion looks poised to compete in season two. If LYKaPro can get comfortable and take some pressure off of Strainer offensively, the Cavs could really make another push this year. Blazer5 want to show the loss to Bucks GG was a fluke. They sure looked impressive in their final game against Jazz Gaming. With the Uprising running double locks, they need first-round pick Doza to star in the team’s important halfcourt offense. The Warriors lost out on the wildcard spot due to a close game against the Pacers. Yet, the Warriors still finished with the second-highest point differential in group play. They look ready to compete in season two. The Pacers have three top players, but do they have enough depth to get them through a trash-talk filled season? The T-Wolves carried a +44 point differential into the knockout rounds at the Tipoff. The Wolves offense looks to give opposing defenses fits on a weekly basis. The Magic outperformed how many believed they would coming into the Tipoff. If Reid can figure out the point guard position, watch out. The Heat qualified for the wildcard spot and carried the momentum all the way to the semifinals. Although the Heat came up short, look for them to be a presence game in and game out. Celtics Crossover Gaming came a game away from a championship again. With big wins over Heat Check Gaming and Pacers Gaming, the Celtics look to carry that momentum into the regular season. The undisputed Tipoff Champion. Is there anything else that needs to be said?